If you’re looking for something to give your home a rustic and cozy feel, a stacked stone fireplace is a great way to go. Whether you live in the Arizona desert, or the beaches of Florida, you can give your home a mountain retreat feel by simply installing a stacked stone fireplace. And you can complement your focal point fireplace with other naturalistic elements. Reclaimed wood, floral arrangements and fabrics with an earthy tone, are just a few that pair well with a stacked stone fireplace. 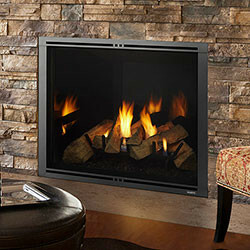 There are many advantages to a stacked stone fireplace. One is that it will increase the value of your home. As the gathering point of your home, a well-designed, inviting fireplace can absolutely sway potential buyers, and help get you a higher asking price. Stacked stone also lasts a long time, and requires very minimal maintenance. When you show off your stacked stone fireplace, many people will think you spent a fortune on it. But in fact, it is an extremely affordable way to go. And lastly, it retains heat. That’s what you call a win-win.